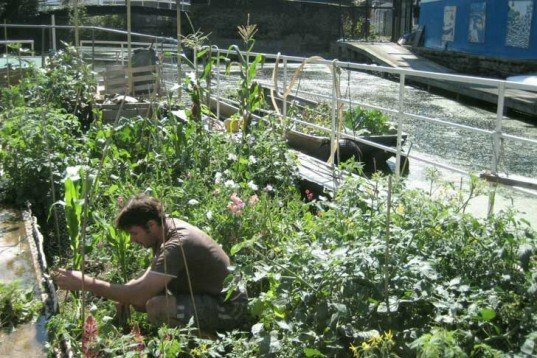 CHUG: A Floating Community That Grows Their Own Vegetables in the Heart of London! Have you ever considered living in a floating home, mortgage free and free to leave at your own whim? There are many groups of people all over the world that have chosen this way of life, and we recently spotted one in central London. Called CHUG, the floating community is a thriving group that also keeps a floating vegetable patch and ducks as pets! Click through the images to discover how life today can still be immersed in nature, even within a big city like London! CHUG, which stands for “Canals in Hackney Users’ Group”, is a charity and a community of boaters who live in Kingsland Basin, in Hackney’s central London. This community has around 14 boats, but there are over 15,000 people living afloat in Great Britain. They use canal narrow boats as homes to navigate the, which were originally built for transporting bulk of raw materials and fuel up and down the country’s long narrow man-made canals. 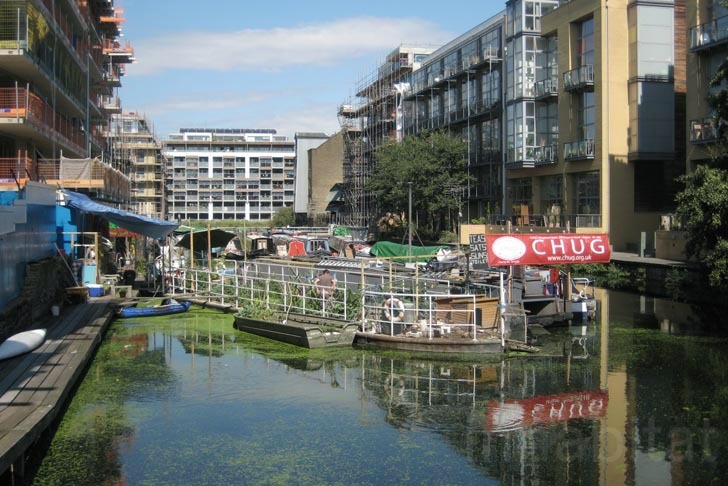 CHUG began in 1983 as an association of local people whose aim was to promote the use of the Hackney’s canal for the benefit of everyone living in the area, while promoting environmental, educational and planning issues as their main objectives. There is a dedicated boat holding a luscious floating allotment that gives an abundance of fruits and vegetables ranging from spinach, lettuce, rocket, countless herbs, onions, potatoes, aubergines, tomatoes, beans, asparagus and even artichokes — all which the community shares. But with five huge noisy developments currently underway in the canal, the allotment boat is pretty important not only as a floating food resource, but in bringing local wildlife back into the area. At CHUG, there is also a bicycle parking area that protects the two-wheelers from rain while they wait for the next ride. 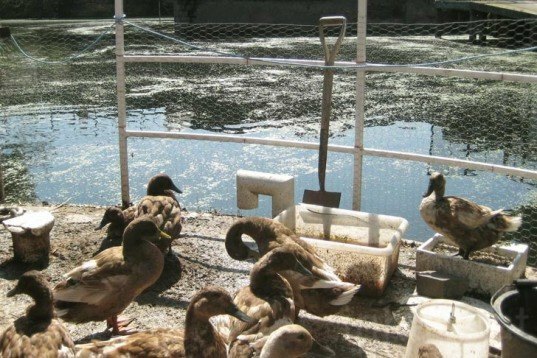 At the very end of the green allotment boat, residents keep friendly ducks for their free range eggs, instead of chicken. And while visitors are welcome to enter the community and learn from the way people live, there is a cute sign advising people not to feed the fluffy dwellers as they can get plenty of healthier food from the water. We’d also like to congratulate CHUG for recently winning the Conservation Foundation’s prestigious Edible Corners Award for their allotment boat. We hope to see more of these sustainable initiatives that challenge the way we live, and would like to live. Really!? is a really nice area and the very long canal path is SO gorgeous! LOVE this post Ana Lisa - thanks for covering this! I used to live near the Hackney Canal and Kingsland Basin and I was always so fascinated by the houseboat communities and wanted to learn more about them. AWESOME! CHUG, which stands for Canals in Hackney Users’ Group, is a charity and a community of boaters who live in Kingsland Basin, in Hackney's central London. This community has around 14 narrow boats, but there are over 15,000 people living afloat in Great Britain. There is a dedicated boat with an allotment giving an abundance of fruits and vegetables ranging from spinach, rocket, countless herbs, onions, potatoes, aubergines and even artichokes. But with five huge noisy developments currently underway in the canal, the allotment boat is pretty important not only for food, but to bring local wildlife back. At CHUG, there is also a bike parking area that protects two-wheelers from rain while they wait for the next ride. CHUG began in 1983 as an association of local people to promote the use of the Hackney's canal for the benefit of everyone living in the area. At the very end of the green allotment boat, residents keep friendly funny ducks -instead of chicken- for their eggs. And while visitors are welcome to the community they are also advised to not feed the fluffy dwellers.